Rokstarr is much better than it has the right to be. 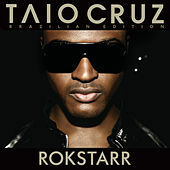 Yes, Taio Cruz is mostly known for one massive hit, the electro-pop player's anthem "Break Your Heart," and he sticks to that niche, save for the occasional sappy ballad like "Feel Again." Nevertheless, it's a successful formula. The London pop star knows how to deliver massive pop-house numbers that can rock a nightclub or your car as you drive to the nightclub. "Dynamite," "Take Me Back" and the Ke$ha-cosigned "Dirty Picture" have radio hit written all over them.